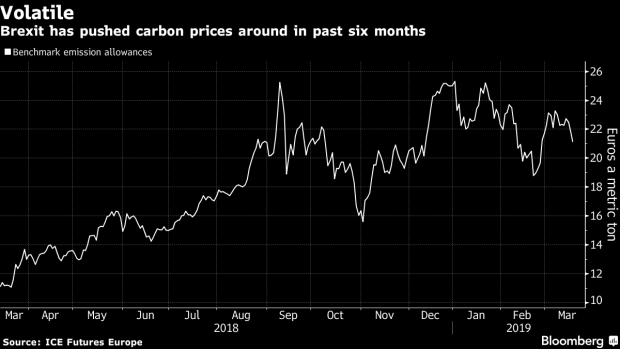 (Bloomberg) -- The U.K. budget is already falling victim to Brexit-related trouble in the carbon market. The government might have lost as much as half a billion euros ($565 million) in revenue in the first quarter after auctions of emission permits were frozen, according to estimates by the International Emissions Trading Association. The decision not to hold government sales under the European Union’s Emissions Trading System was taken last year amid concerns 2019 allowances may become invalid in the event of a no-deal Brexit. At the same time, some U.K. emitters are knocking on the government’s door asking for financial help in meeting their 2018 emission obligations since they cannot use 2019 permits to cover last year’s emissions. That’s because the allocation to companies of free allowances for this year was also put on hold amid uncertainty over the country’s withdrawal from the EU. British Steel, one of the U.K.’s largest steel producers, is in talks over emergency government funding after a delay in the nation’s exit from the EU left it unable to meet its obligations in the cap-and-trade program, Sky reported on Saturday. The EU ETS puts pollution limits on almost 12,000 facilities owned by manufacturers and power producers in the 28-nation bloc. The price of benchmark permits to pollute in the EU market more than tripled last year due to sweeping reforms that will curb oversupply. The allowances for delivery in December traded at 26.86 euros per metric ton on Tuesday. The EU has enacted rules meant to shield the ETS from Brexit. They aim to avoid the market being flooded by permits issued or sold to companies by the British government when the country’s obligations expire. If Britain leaves with a deal, existing rules will probably be mostly extended by two years. In that period, the U.K. plans to decide whether Britain wants to remain linked to the market or create its own alternative climate measures, potentially its own market or tax. If there’s no deal, U.K. companies will crash out of the emissions trading system on the day that Brexit becomes effective.